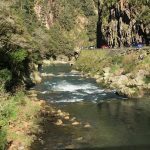 There is lots to do in Queenstown and lots to spend your money on, especially when you factor kids in as well. 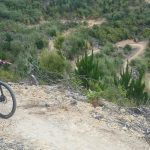 Thankfully once you have invested in your bike gear mountain biking is a relatively low cost activity. 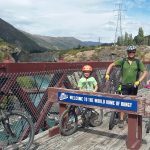 So with four days to spend ( as little money as possible ) in Queenstown we decided to mountain bike. There are lots of different options depending on your need for speed and again how much money you want to spend. 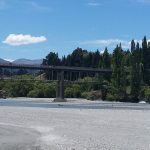 There is the Skyline Gondala tracks, a mountain bike park at 7 Mile Bay and a range of trail rides between Queenstown, Arrowtown & Gibston Valley Winery. 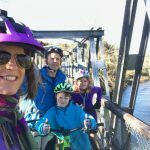 The team at Round the Basin Bike Tours were super helpful and as we were riding with the kids and wanted it to be a fun experience for them (and us) we decided to ride out to the Kawerau Bungy Jumping bridge, about 25km from Queenstown. We booked the pickup and hoped for fine weather the next day. The day dawned bright and sunny , we probably would have ridden in the rain but is always nice to enjoy the views in the sunshine. 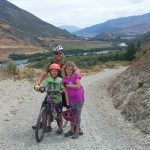 We drove out to Frankton and parked there to cut a few kilometers off the trail for the kids and avoid having to cross roads etc getting out of town. 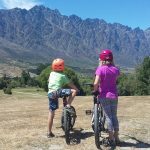 Where we joined the trail gave us stunning views of the Remarkables for the adults and adorable Shetland Ponies for the kids. In fact the kids had so much fun patting the Shetland ponies and I was enjoying the views so much it was hard to get started. As luck would have it the views continued to deliver along the trails but the only other wildlife we saw were rabbits. 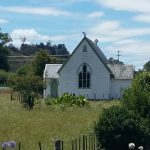 Wow, I knew they were a problem in the South Island but it felt like they were taking over as they sat in fields not concerned at all by our passing. Anyhow back to the trail; the track is very well made and mostly downhill with three relatively small hills to climb. There was a bit of bike pushing for the kids, well make that bike pushing for the adults but nothing too major. 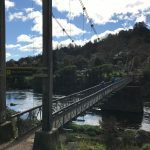 Some highlights from the part of the trail that we rode include; riding over the old restored Shotover river bridge, riding through farmland alongside Kawerau River and watching the jetboats go past and the Arrow River suspension bridge (it’s a long way down to the river ). 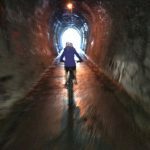 The views along this trail are simply stunning from mountains to rivers and amazing bridges. 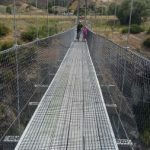 And if there wasn’t enough adrenalin on the trail you could always book in a bungee jump from the Kawerau Bridge. We just chose to watch but still a great end to an awesome ride. When we did the ride the distance wasn’t marked and after about what we hoped was half way we did feel like we were rushing to meet our pickup. As my very wise Aunt later told us – its always less stressful to be dropped off and ride ( or walk ) back to your car if possible. If wineries are your thing you could carry on riding down river to the winery for a late lunch. 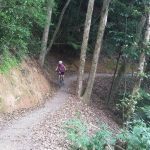 Waitangi Mountain Bike Park where have you been all my life! 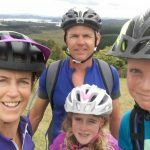 My husband’s parents retired to Paihia about 15 years ago so it’s fair to say we have spent a few holidays in Pahia but sadly not had any where to ride. 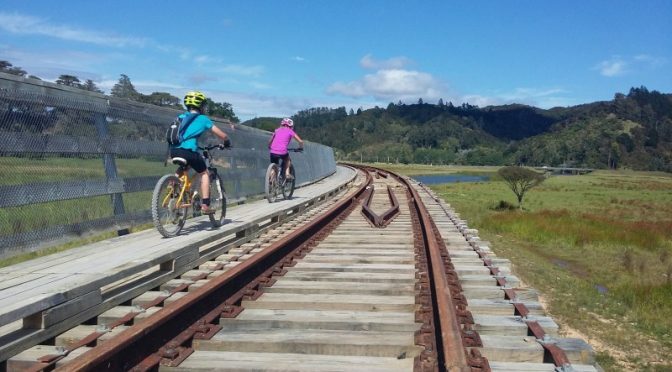 Apart from that time we bought our bikes and rode the forestry tracks which just isn’t that exciting. 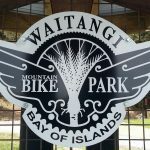 So it was with great excitement that we heard that Waitangi was getting its very own mountain bike park. 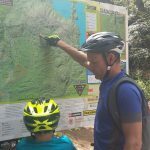 So after a stop for coffee on the way and another read of the trail maps we were in to it. The trails we rode in on started off a little bumpy and stony, and unfortunately my daughter took a tumble. Lucky she is tough like her mother and got back on her bike or it could have been a very short ride indeed. 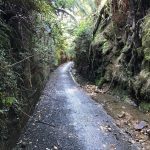 We headed up Taane’s climb which was a relatively easy climb. 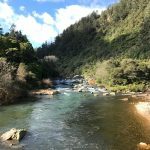 Was a great view from the top and then a lovely flowing ride down Kiwi Flow. As the park is quite new there are limited rides at this stage so it was up Taane’s climb again, only this time we didn’t go all the way to the top and rode down Kaokao Chaos. 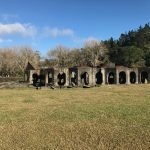 All in all a great addition to the Bay of Islands. 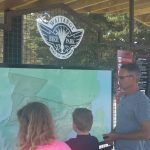 We thoroughly enjoyed our ride and can’t wait for future development of the park. It’s very dusty when the clay is dry so glasses would be handy. It’s further out of town than we realised so we are pleased we didn’t ride out like we had thought we might. 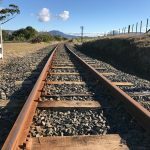 At the moment the only way to pay is for a yearly pass which at $25 we figure is a good investment into further trail development and a reason to visit the in-laws. 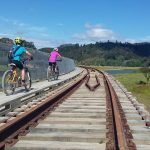 We had ridden the Opua to ‘the bridge’ section of the Twin Coast Trails once before but we had heard the bridge was open for the summer so we were excited to be able ride over the bridge and make it to Kawakawa for a coffee. It was predicted to be a 29 degree day so we set out early, OK early-ish we are on holiday after all. 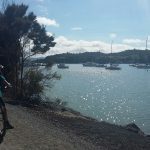 Opua harbour was looking stunning as we drove to the start of the ride. The carpark for the bike ride already had a few cars in which was good to see. 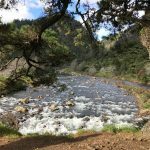 The tide was in and we were pretty much instantly treated to lovely views of the Kawakawa River. 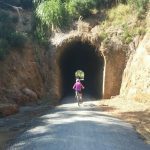 The ride is on gravel that has been put down over old train tracks and is relatively flat and an easy ride. 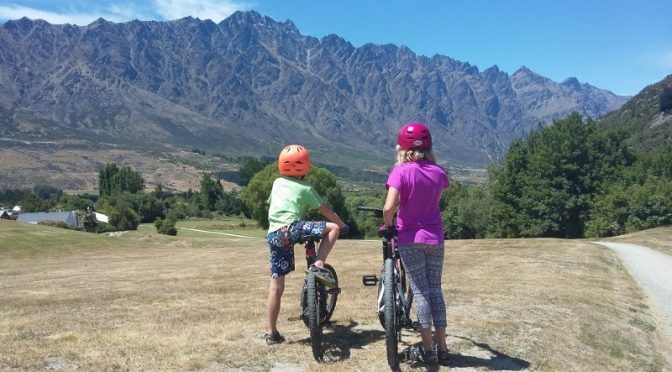 When we are riding other trails with the children we stop to give them a rest every so often but the only reason we were stopping was to enjoy the stunning views. 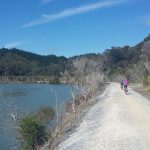 Usually from the Opua end you can only get to the bridge before Kawakawa ( just short of a coffee stop ) but over the Summer period ( of 2017 ) the council has got the bridge to a safe standard for people and their bikes. 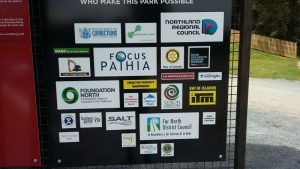 Thanks Far North District Council! Not only does this ride have a bridge, its got a tunnel as well. Just short enough that you can easily see all the way through. 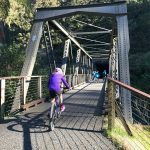 Usually I don’t enjoy riding over bridges ( think Timber Trail suspension bridges and the Old Coach Rd viaduct ) but I really enjoyed riding over this one. Maybe it was the thrill of knowing that its only open for a short period of time. 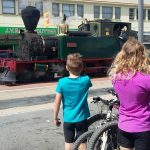 From there it was a short ride to Kawakawa for a coffee and a refuel for the kids and as an added bonus we go to see the steam train going through town and coming back again. If you haven’t checked out the Hundertwasser Toilets they are well worth a visit as well. The return ride was just as enjoyable and an easy 11km return ( we rode 22km in total ) without so many stops for photos. 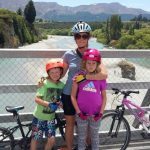 This is a great ride to do with kids or are enjoying holiday mode a little too much. As we were leaving there were people about to do the rides with e-bikes. Check if the bridge is open. 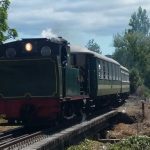 We found out the bridge was open on the Bay of Island VIntage Railway website and at that stage it was open until the 8th of February 2017. 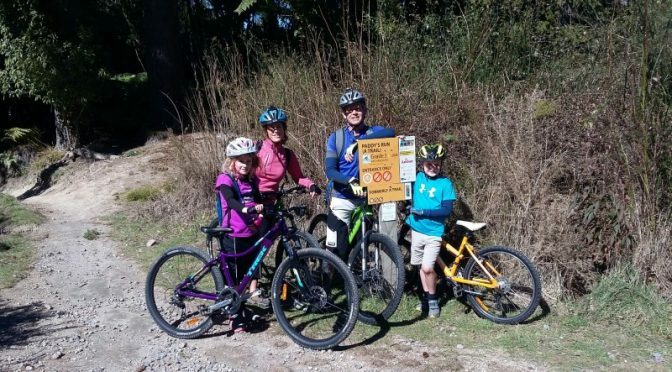 We were mountain biking with a group of adults who hadn’t ridden with our children for ages and one of them had never even meet our children. The adults and I were catching up to my husband and the kids who had gone on ahead. We started riding up a solid 20 minute uphill trail ( Sidewinder for those of you that know the Redwoods ). 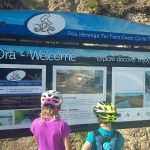 We have ridden it with our kids once before and there was a bit of bike pushing but it’s all part of the experience. The guy who didn’t know our kids was saying ‘your kids can’t be on this trail’ and at one point he actually stopped and said I should call my husband to find out where they were because there was no way they were on this trail. Not sure if he was questioning my navigation skills (which are questionable ) or my children’s fitness levels. So we got to the top of the hill and there were my little mountain bikers with big contented smiles on their faces. 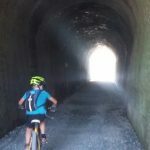 ‘I rode all the way’ says my 8 year old – and then I had a big contented smile on my face. Ok, so I am pretty proud of my kids. 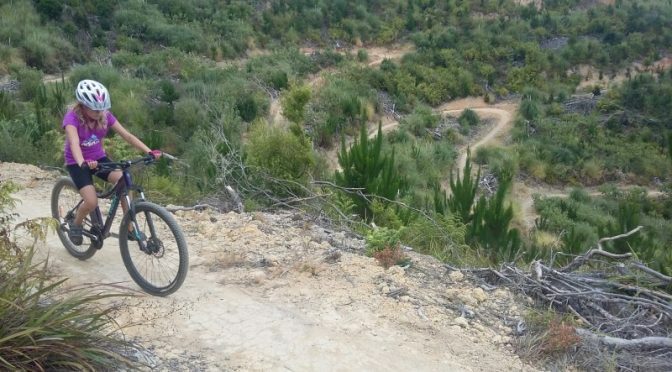 They love mountain biking and we love mountain biking with them but it wasn’t always like this. I can still remember the first time we went riding with the kids, they were 5 and 8 years old. I almost didn’t change into my bike riding gear because I thought it was going to be a short ride. 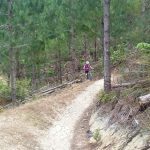 Of course we started off on the easy trails and there was a lot of bike pushing and moaning…and not just from the kids. After about 6 km we headed back to the café for a refuel and probably thought that was it but after some cake they were keen to go out again so we ended up riding 16km the first time. 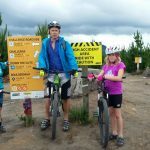 We started going to Rotorua on a more regular basis and took the kids riding about once a month with varying degrees of success and lots of perseverance. 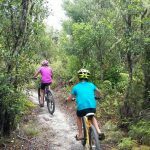 We spent a lot of time getting their confidence and fitness up on the kid’s trails. And then gradually the moaning decreased, the enthusiasm increased and we ventured onto harder trails. And they aren’t just fair weather riders either – one time it was pouring with rain when we set out and didn’t stop the whole time we were out. Not only was it wet, it was cold. When we got back to the carpark after 2 hours ride we were covered in mud, soaked to the bone and freezing cold with the biggest smiles on our faces, kids included. Nothing more bonding and character building than a shared adventure. 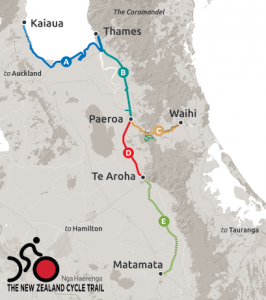 So it might not happen overnight and there will probably be a few tears but it’s worth it to share your love of mountain biking or tramping or whatever form your adventuring takes because as the good memories grow the challenges of getting there fades. In fact the challenge of getting there are part of the good memories. 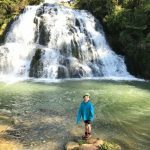 So when our friends thought there was no way my kids would be on the steep uphill trail I knew they would be because we had put in the mud, sweat and tears to get them there. 🚲Try and get out on a regular basis. Just like us adults, the more your kids do something the easier it becomes. 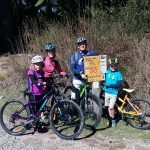 🚲 Don’t think that your children need to be great riders before they hit the trails. 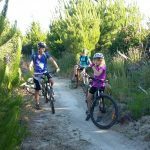 There are many family friendly trails around the country that are a great place for kids to get their confidence up. Start slow and easy and focus on the fun. 🚲 It’s important to have the right size bike for your child. A small bike doesn’t necessarily mean easier and neither does having the seat lower. As bikes gets bigger so does the wheel size which can make it easier to maneuver over rougher terrain. Having the seat at the right height is key too and enables the child to get better return on the stroke effort. Pop into your local bike shop and have a chat to your expert to ensure you’ve got the set up right. 🚲 Invest in gear that makes the riding more enjoyable for everyone. Obviously a good helmet is key, but also gloves, and cycling shorts are beneficial. Trade Me and local buy/sell pages are great for picking up deals. You could also suggest to friends and relatives that they buy gear as gifts for your kids. 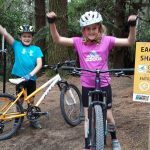 🚲 Think outside the box with helping younger kids up tougher inclines. Inner tubes are great as tow ropes or I have even seen someone using a retractable dog lead to tow a child up a hill! 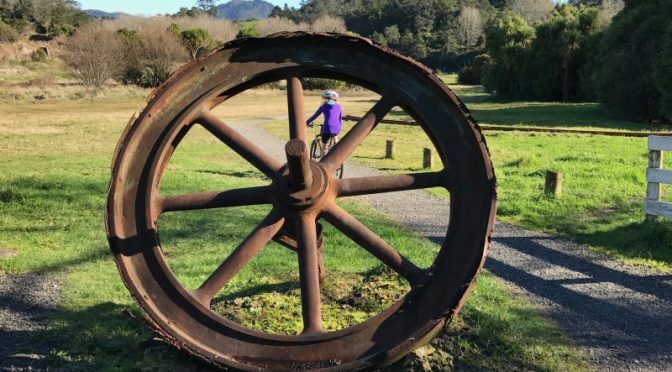 🚲 Be patient – both on the trail and with your child’s progress. While it might not happen overnight and there may be a few tears and frustrations, your child will get the hang of it. Give loads of encouragement and praise along the way. 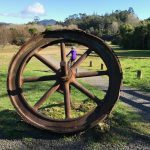 Check out my blog on training for Tongariro Crossing with kids.